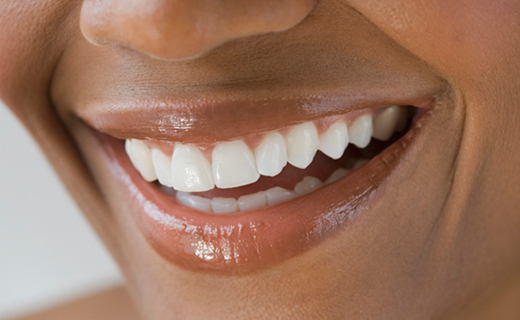 Veneers are porcelain facings, which are bonded to your existing teeth. They can alter most cosmetic problems and totally transform a smile in just two appointments. Veneers are thin, translucent coating made out of porcelain. They are applied to the teeth to improve their color, size, or shape. They can fix a myriad of cosmetic problems and transform your smile into one of beauty. They are sometimes referred to as “instant orthodontics” as they can transform crooked teeth into a beautiful smile in typically just two appointments. Smile makeovers as seen on many television programs are often the result of the placement of porcelain veneers. Porcelain veneers take at least two appointments because we must first shape your teeth and prepare them for the new veneers. Typically, this means removing some tooth tissue to make room for the new veneers, and roughing the tooth surface to ensure a tight, strong bond. Next we will make a wax impression of your teeth to be used as a model for the porcelain to be shaped to your precise specifications. At Lasher, Harriman, and Associates, we use the premier lab in the United States to fabricate the beautiful porcelain veneers. Once the veneer is in place, it will function just like a regular tooth. A veneer is considered a permanent tooth restoration, but that doesn’t mean it is expected to last forever. Proper care and habits and regular dental examinations and cleanings will allow you to keep your veneers looking beautiful. I received outstanding work and excellent customer service from Dental One Associates. They certainly improved the appearance of my smile!